What makes Great Britain so intriguing is not just the tea, but the food. Not only do they have an excellent taste for chocolate, desserts, and cooking, but they also have a great taste for snacks! One of the most popular snack foods in Britain is the crisp. What’s a crisp? It’s the familiar potato chip! Just don’t call them (potato) chips or you might be referring to the fried potatoes we Americans know as fries! Britain’s largest crisp manufacturer and the most popular brand is Walkers. The logo looks strikingly similar to the Lay’s Potato Chips logo (they are both owned by Pepsico) but the huge difference is the flavor variety! The United States has flavors like sour cream and onion, barbecue, and cheddar while Great Britain has Prawn Cocktail, Worcester Sauce, and Cheese and Onion. Wait, Worcester Sauce? Prawn Cocktail? Yes, you read it correctly! These are among some of the traditional flavors that also include Ready Salted and Salt and Vinegar. 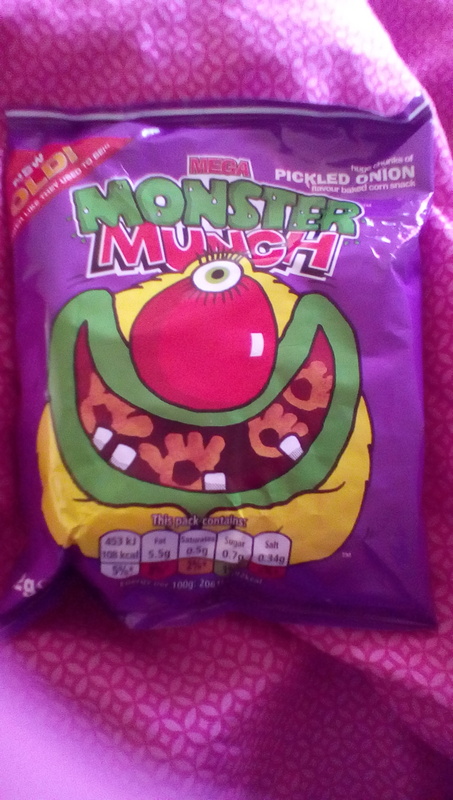 Along with the standard potato crisp, there are other kinds like the Monster Munch! A baked corn snack flavored with Pickled Onion, I was a bit nervous but adventurous when I obtained a bag! My sister, who was over at my house when I opened the Monster Munch, wrinkled her nose. You see, us Americans are not used to pickled onions, so it sounded a bit odd. Then, we tried them. We were completely surprised! The texture is similar to the onion ring-like chips we grew up with called FunYuns, but the taste is completely different! These Monster Munches are tangy and mouthwatering! My sister was even taking the bag and running around the house, getting our family members to try it before telling them it was pickled onion! Crisps have been in homes both British and American for generations, on lunch plates, in children’s lunch boxes, and even alongside soldiers during World War II. If you go anywhere in the UK, crisps are sold nearly everywhere as much as you see tea. Millions of packets of crisps are sold every year in the UK, and its popularity does not seem to be faltering. And if you do end up in an English crisp section, do try Walkers Tomato Ketchup crisps! You would be surprised at how delicious those are!